Have you ever heard of G.A.S. (Gear Acquisition Syndrome)? 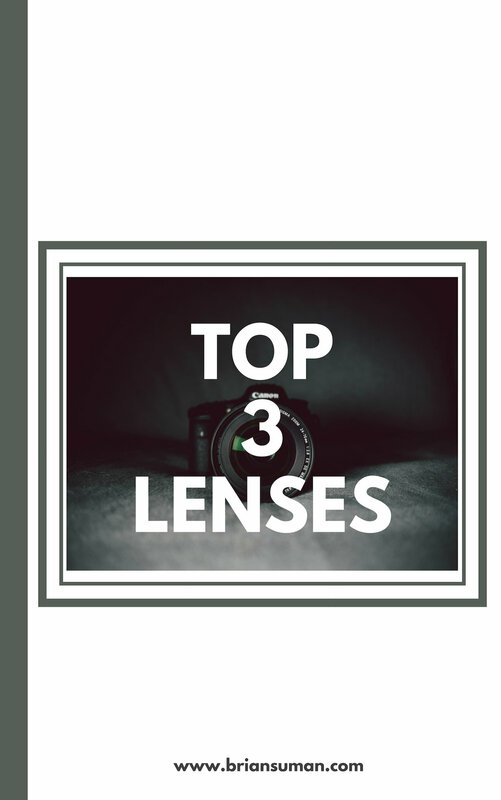 Well, you could say I have suffered from it at times however being fortunate enough, if there is such a thing with G.A.S., to have been able to acquire various lenses it has given a wide range of experience so I thought I would give you my top 3 lenses and the pros and cons. Again, this is very subjective due to what I would typically shoot and my choice to use Canon and Sony systems. Over the past couple of years this lens has become my go-to for portrait sessions, both studio and outdoors. Pros: Tack sharp, fast for sports action, great compression especially for portraits. Since I recently switched to using Sony, this is my go-to for wide angle shots and video recording. If you need a solid lens for event photography or one that covers a good focal range this is the one you need in your tool bag. Pros: Good focal range, light compared to other Canon lenses. Cons: Expensive, not as sharp as other Canon glass on my list. I would love to know what your top choices are for lenses so shoot me a comment below. If there is anything else with any of the lenses listed you would want more information on please let me know and I would be happy to elaborate. With or without G.A.S., you can still bring your imagination to life.